With your domain name linked to Webasyst Cloud, you can create email addresses based on your domain; e.g., info@mycompany.com. The actual mailbox for your email address may be located either in Webasyst Cloud or on mail servers of an external email provider; e.g., on Google's. If hosted in Webasyst Cloud, a mailbox can be used only for receiving mail; e.g., to collect customer requests by means of Helpdesk app) and cannot be used for sending email. If the ability to send emails from your mailbox is essential, then we recommend you to host it on Google Apps servers as described below in this article. 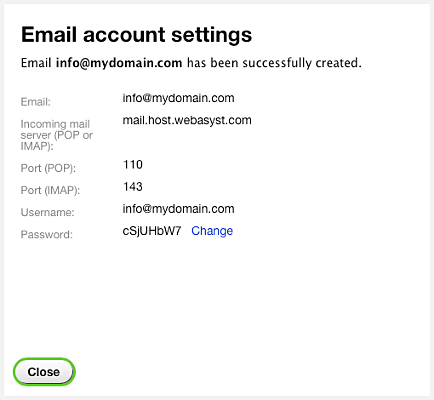 To set up email addresses in Webasyst Cloud, log into your account backend and open Cloud app. In section Email accounts click on New email account. Specify the desired email address in the pop-up area. Upon confirmation, copy the provided mailbox connection credentials and use them where needed; e.g., in your account's Helpdesk app. 1. Sign up in Google Apps service. Add a TXT record to your domain settings. If you do not know what it means, please contact Webasyst support service. Upload an HTML file to your website. This option is not available in Webasyst Cloud. Add a META tag to your website. Copy the generated META tag in your Google Apps account and paste it to file index.html of your design theme following the instructions. This option is available to you only if your site domain in Webasyst Site app settings does not have the www prefix; e.g., domain.com. If your site's primary domain version contains www prefix, then this verification option is not available, either. 3. In Google Apps help center, find information on the MX servers of that service. Note the trailing period at the end of each address. 4. Add corresponding MX records to your domain name DNS settings via your DNS or web-hosting control panel. If you do not know how to do it, please contact Webasyst support service. 5. Wait until new MX records are propagated all over the Internet. The propagation may last up to several hours depending on your domain name DNS settings. You can verify that new MX records have been updated using special online services; e.g., http://www.all-nettools.com/toolbox/nslookup.php. 6. 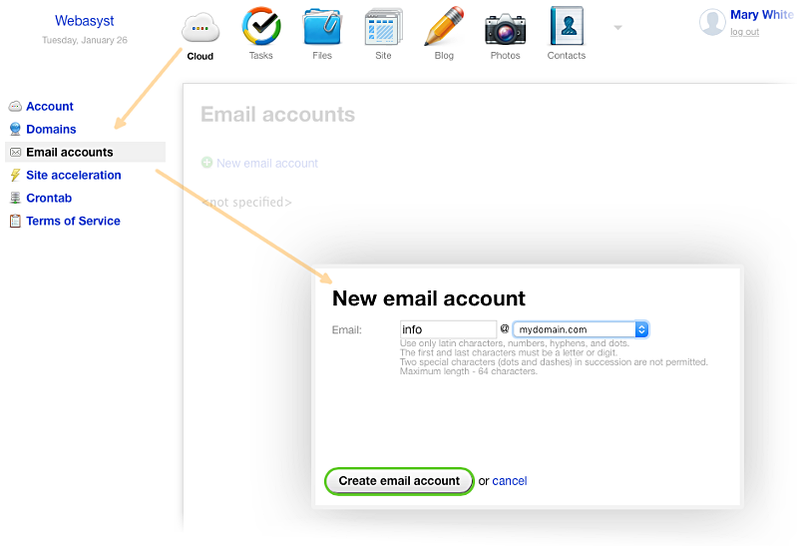 Finally, create an email address in your Google Apps account.